“If you measure, it doesn’t taste good.” And that’s how it started. 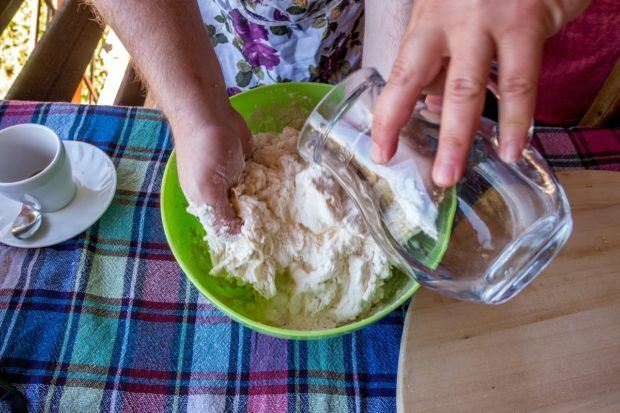 We were thrown in front of a cutting board, a large bowl of flour and a carafe of water, and told to mix thoroughly. No preamble. No introductions. It was unlike any cooking class we’ve ever taken before. But the result was a deeper appreciation of Macedonian culture than we ever thought possible. We’d come to the mountainside village high above the city of Ohrid, Macedonia in search of a more meaningful experience. While we fell in love with Lake Ohrid, it was a bit worldly. There were other tourists from around the world in town for a folk festival. We wanted something unique. We were in search of something different. 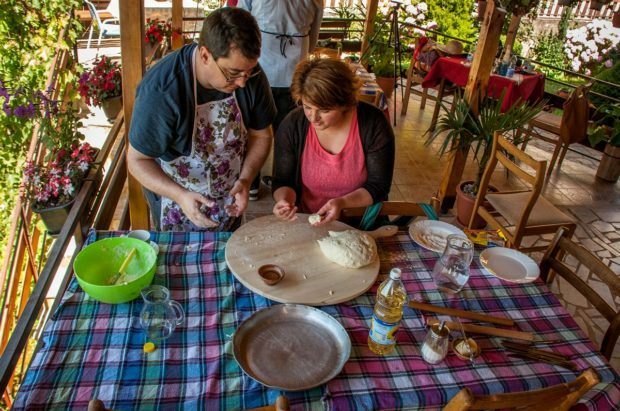 Our Ohrid cooking class host was Anita of Risto’s Guest House. The guest house was named after her husband, Risto. But make no mistake, Anita is the boss. She marshalled us to our stations, barked instructions, critiqued our flawed execution and provided coaching. Anita was a one-woman tour de force of personality, knowledge and wit. Every once in a while, she would utter her mantra: “In our kitchen, we never measure. If you measure, it doesn’t taste good.” True to her word, Anita never once produced a measuring cup or any other traditional cooking instrument. 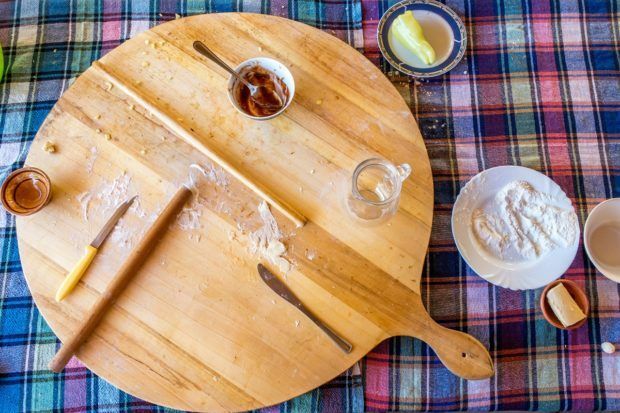 Our tools were a large wooden cutting board and wooden dowels, which doubled as rolling pins. The entire cooking experience was done by feel…and taste. There was a lot of taste testing at Risto’s Guest House. And that made for a fun experience. 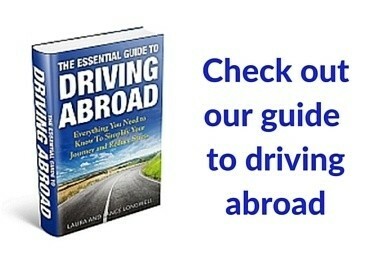 Macedonia sits at the crossroads of southern Europe in the Balkans. 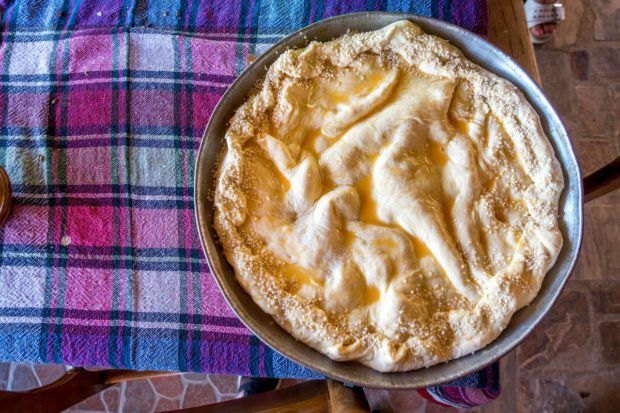 Macedonian food is influenced and inspired by Greek, Turkish, Italian and even North African. 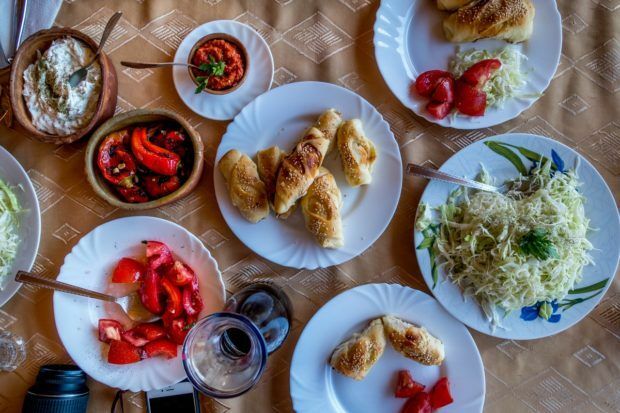 Macedonian cuisine features tasty dishes like Burek, Kebapi, Ajvar and Selsko Meso, many of which have found loyal followings outside of the region. 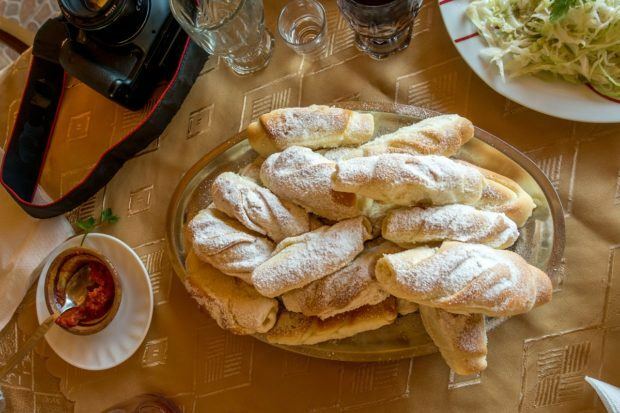 Put simply, there’s no bad eating in Macedonia. 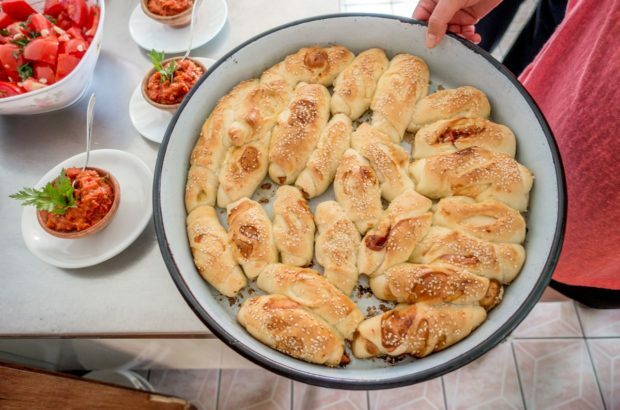 For cooking class at Risto’s Guest House, we made two different Kifli – a kind of doughy roll-up. One was savory (ham and tomato sauce) and the other was sweet (filled with chocolate and topped with powdered confectionery sugar). My job was to make the Kifli. I mixed the gooey dough with my bare hands, but creating small balls and then rolling out the dough. The stuffing was added and then I rolled them up to cook in the oven. In between each roll-up, I sipped my coffee and chatted with Anita about life in Macedonia and her hopes for the future. 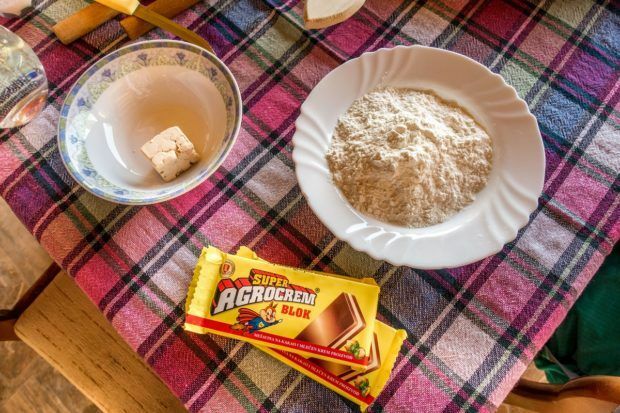 Meanwhile, in the main kitchen, Laura was whipping up a Komat – called the nationalistic pie. 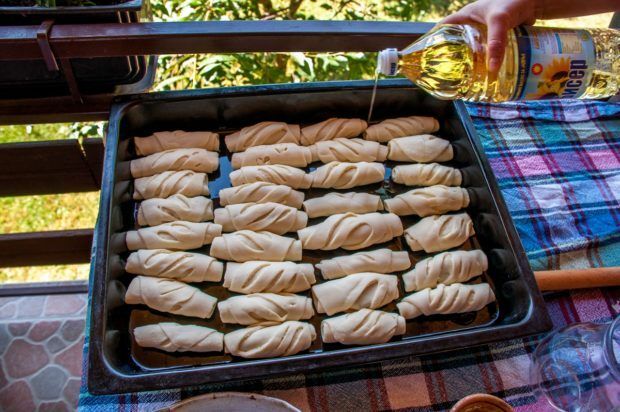 The Komat is a doughy concoction that is folded in on itself in the shape of the Macedonian flag – the rays of the sun folded in on itself. Deep within the protective folds, there was a medley of peppers and local sweet cheese. The result was a mass of goodness inside dough. It was delicious. After our Kifli and Komat cooked, we sat down to enjoy. 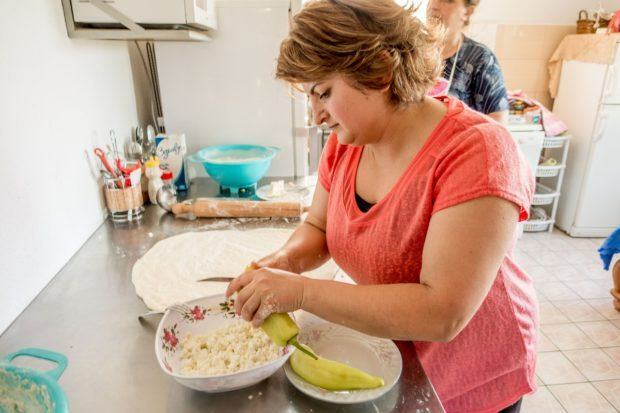 Anita had prepared a ton of side dishes to go with our masterpieces, including tomatoes in olive oil, roasted red peppers, a shredded cabbage salad and lots of ajvar. Lots and lots of ajvar. Somewhere on that mountainside with Anita as our guide, we learned about the heart and spirit of Macedonia: fiercely proud, staunchly independent, but focused on the simple things – all with a jolly sense of humor. We visited Macedonia as guests of JayWay Travel, specialists in custom tour packages across destinations in Central and Eastern Europe. All opinions of the sweet and savory are our own. 14 Ways to Have Fun in Charming Annapolis, Maryland One of our very favorite places on the East Coast, the beautiful city of Annapolis often gets overlooked in favor of its larger neighbors like Baltimore or Washington, DC. But Annapolis is a waterfront retreat, a college town, and a picture-perfect capital city full of fun things to do.